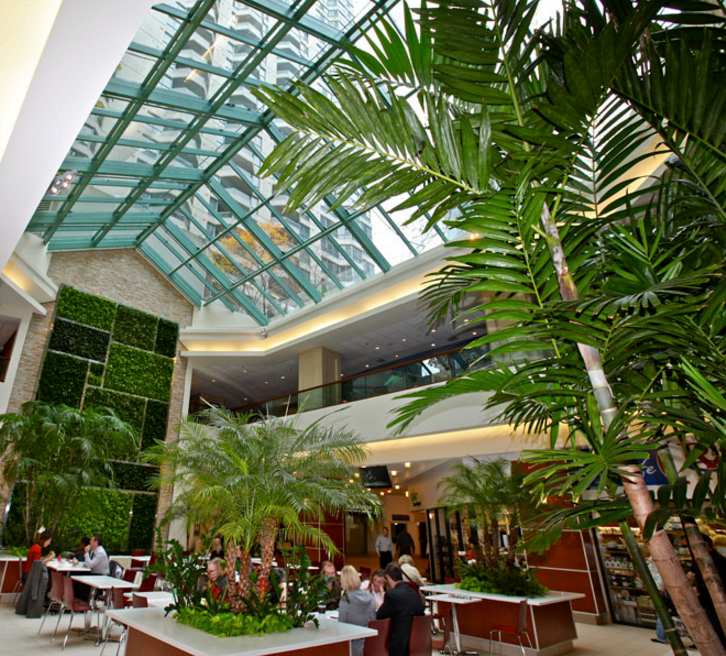 One of the indoor atriums that I've always found lovely is the Bank of Canada Garden Court Atrium (that was accessed from the Spark Street side). Now that the buildings are being renovated, I was wondering what would happen to it. It was such a lush, relaxing spot for people to enjoy - especially in the winter! Remember the space where you could see the Yap stone? It was also a popular spot for wedding photos during the winter months. The Currency Museum blog explains that the new museum will be in the lower level but it doesn't provide information on how the main floor will be transformed. 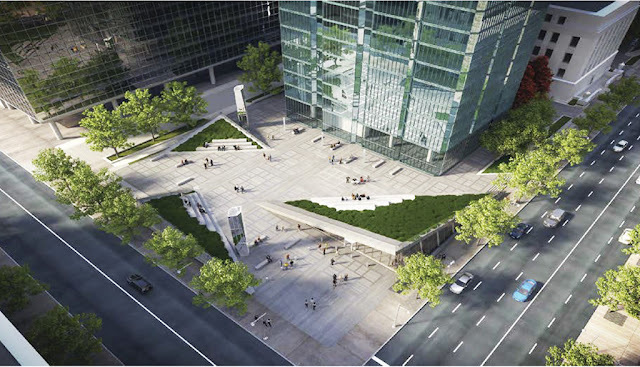 From the website: "It is there, beneath the plaza at Bank and Wellington Streets, that the new Museum is planned to be - taking up the east end of the huge former cafeteria including the glass ceilinged ‘waterfall room’, and the large common area where staff events took place as recently as last summer." The courtyard space on Bank Street looks really wonderful and provides some great public seating - I was wondering what those strange imposing triangle structures they were building in that space were. 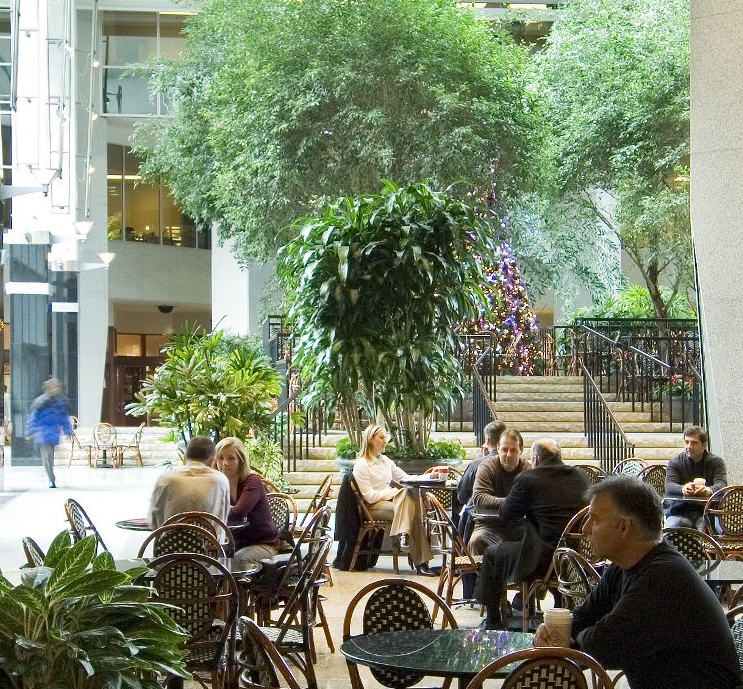 Sadly upon doing some further online research, it seems that the Bank of Canada IS considering eliminating this atrium for reasons of safety and space requirements. This 2014 online article from The Cultural Landscape Foundation shares the full story and provides some thought on the need to save this atrium and preserve the architectural integrity and history of the design. There are many entrances to this atrium: through the Starbucks, from all street sides including O'Conner and from its official address on 99 Bank. Depending on where you enter head towards the center where you'll find a large courtyard area including an elevated spot with a waterfall which gives visitors a great respite from the usual city experience (noise, grey, packed sidewalks). Great retreat in the winter but it does get busy during lunch hours. This indoor spot is well-known for its green living wall. A popular place with the downtown lunch crowd (so again it can be quite busy mid-day) who likely come for the light and airy peaceful space. 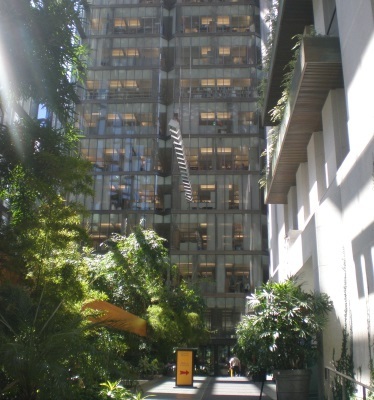 Come on a sunny day as you will get the maximum benefit from the vast glass ceiling and enjoy the large tropical trees placed strategically around the courtyard. 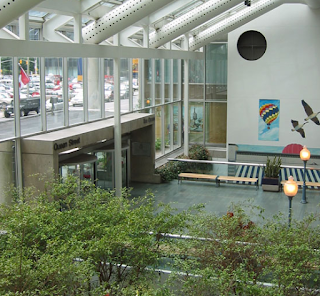 There is access from all sides of the buildings and the atrium is found in the west end. Inside this popular seventies mall (who remembers shopping at "240 Sparks" and/or going to the movie theatre here?) you can find a small courtyard downstairs with tables nestled beside living trees. It has undergone a renovation in the past couple of years but still includes both the "Bright" Tree Court and a "Relaxing" Waterfall court. Some of the anchor stores have moved out including L.C.B.O. and Holtz. There is access from all sides including Queen Street, Bank Street and even along the Sparks Street mall. It also has a green roof that has been opened to the public on past Doors Open events. What other favourite green spots do you have in Ottawa to visit in the winter?